On UBX Harmonica you'll start with the basics of how to hold the harmonica, how to blow and draw correctly, and how to play beginning notes and melodies. Then you'll move on to more advanced concepts such as playing a major scale, articulation, chords and arpeggios. Finally, you'll learn special techniques unique to the harmonica such as bugle calls, train sounds, hand vibrato, shakes, and much more. 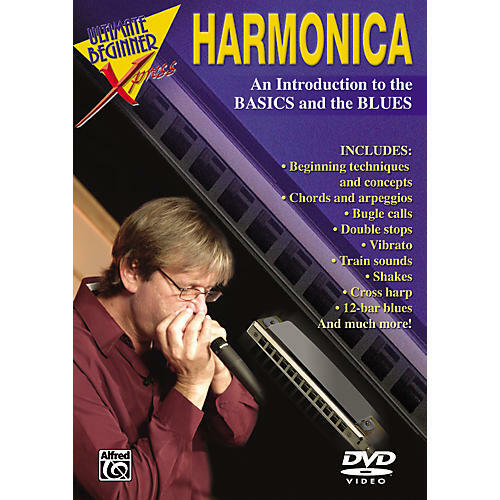 There's also an extensive section on cross harp and the 12-bar blues, and special features such as a bonus lesson, bonus performance, and printable PDF reference materials, making this the most complete harmonica instructional DVD available!